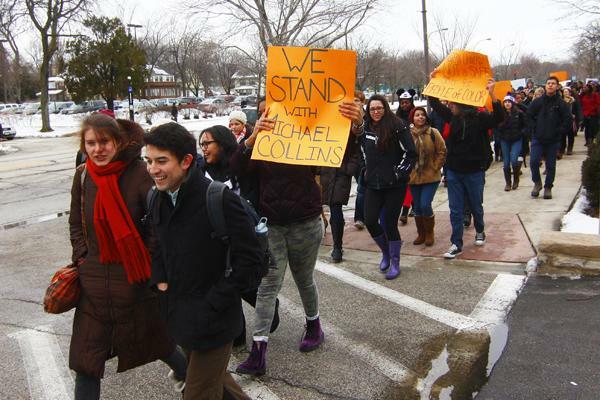 One student holds a sign expressing solidarity with Michael Collins as they walk down Sheridan Road during Thursday's march. As Weinberg senior Paul Jackson stepped up to The Rock and took the megaphone, hundreds gathered began to chant and cheer, one student even beating a drum. His voice booming across the courtyard, Jackson called on the students to fight for change at Northwestern. Jackson was one of more than 100 students who left their classes at 1:30 p.m. Thursday to march down Sheridan Road in a demonstration against what they called institutional racism at NU. The march was planned by student organizations Alianza and For Members Only in response to the treatment of Michael Collins, a University maintenance worker who says he found a black stuffed bear hanging as if lynched at his desk after experiencing racist treatment from his co-workers. The march and following rally addressed many incidents of racial bias at NU, although it was sparked by the Collins case. “I hope one day racism will not exist, not just at Northwestern, but throughout the country,” he said. Prior to the march, students gathered at Tech spoke about the incident, which they said University Police have investigated and have not deemed a hate crime. The University has declined to comment on the matter, and officials said they are dealing with it internally as it is a personnel issue. They then began to move down Sheridan Road, which was lined with police officers. McCormick junior Jay Jordan and Weinberg senior Justin Clarke were at the front of the crowd, leading the participants in chants over the megaphone. Many passersby who did not know what the march was for pulled their earbuds out and watched as the students walked by. Some followed the marchers to The Rock. Sandra Garnica, a Weinberg senior who helped organize the event, said she was thrilled with the turnout for the march. Weinberg sophomore Saroja Cuffey was in political science Prof. Reuel Rogers’ class, which ended early Thursday so students could gather for the march. Cuffey was not the only student who typically would have been in class during Thursday’s march. Many students said they cut class altogether, while some walked out in the middle. Weinberg junior Arshad Haque said he and two classmates walked out of his Arabic class of 12 students. Brown said that too often, racial tensions at NU “go unnoticed.” She said she has experienced “different levels of racism.” She pointed to being called “the n-word” her freshman year by two white male students who were driving by in a car. She said she never reported the incident because it was just one of many. “A lot of us don’t say everything that happens, but when things are called to the forefront like what’s happening today, it helps to shed light on all of our stories,” she said. A few of those stories were shared when the protestors arrived at The Rock, where more than 120 students signed in for attendance. As students walked out of classes in University Hall and Harris Hall, many paused to watch along with some professors and administrators. Students of various races were present. The organizers began their demonstration at The Rock by dumping black paint on it to protest injustice throughout the NU community, not just the black or Hispanic communities. At The Rock, Garnica addressed the treatment of Collins. She said she knew what it felt like to be treated like that at NU and that everyone in attendance did, too. Students read letters that were written at For Members Only and Alianza’s letter-writing campaign Feb. 21. 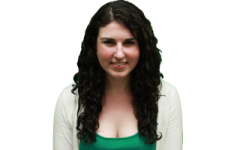 The letters revealed some personal experiences that had not yet been shared with the NU community and recalled some of the more public racial bias incidents that occurred on campus in recent years. The students cited many of the incidents that occurred in the last year, including the ski team’s Beer Olympics party, where students wore culturally insensitive costumes, the egging of Asian American students and the verbal harassment of Tonantzin Carmona (WCAS ’12). Bienen senior Rohan Zhou-Lee wrote a letter prior to the demonstration that was publicized on the event’s Facebook page. He spoke Thursday about how things have not changed in four years to improve services for minority students or mental health, citing a student’s suicide his freshman year and the deaths of students this year. Garnica echoed complaints that nothing had changed in years as well, citing the blackface incident that occurred when she was a freshman. Although President Morton Schapiro was not in attendance at Thursday’s demonstration, he did comment on it in an interview with The Daily. The students at Thursday’s rally agreed. Garnica called on them to continue this movement with community talks. “We need to … know who that person next to you is and … the racism that they have felt so you can feel it, too,” she said. Jackson said students need to stop accepting racism, even when friends don’t understand. “Stop accepting second-best, even if second-best is better than where you started,” he said.